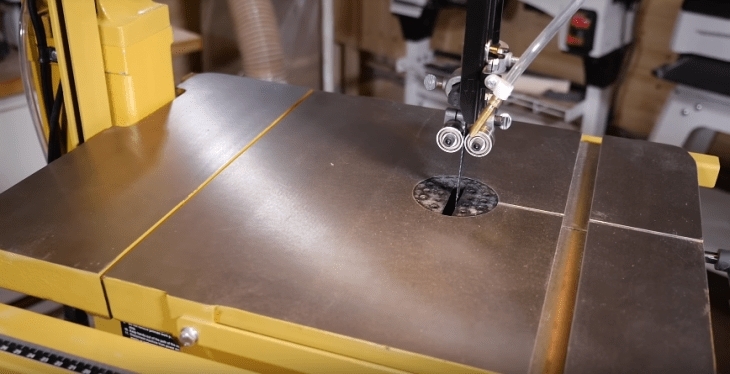 Best Bandsaw for Resawing Reviews: Top-5 in April 2019! Band saws, that versatile carpenter’s tool that cuts anything and everything with ease. What the band saw is a highly underestimated tool that should be the first item on any aspiring woodworkers list of Capex. (Capital Expenditure) and yes, it might sound expensive, but it’s really not. Band saws are actually much more versatile and useful than any miter saw, and there are many different models and makes to choose from. The bottom line is not about dimensions, or budget, nor reliability and durability. It is all about safety. Band saws are perhaps the most dangerous of tools in the woodshop, and this is only due to the focus and attention required while using them, together with the safety features and safety accessories that only a dedicated woodworker will apply. There are two models to choose from, the table top and the stand mounted. Both have pluses and minuses but essentially perform the same duty. In this article, I present you with five of the best value for money stand mounted saws. The WEN 10-Inch Two-Speed Band Saw is a retro designed saw that takes us back to an era that defined the 20th century. This model comes with a 3.5-amp motor and a 9-3/4 inch throat that cuts up to six inches deep and 9-3/4 inches wide. 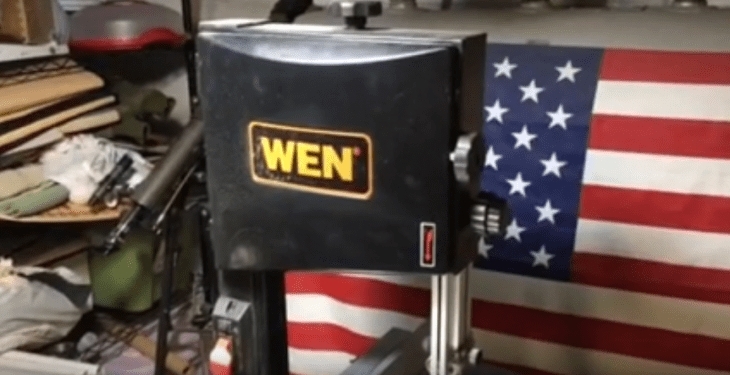 The WEN is a two-speed band saw and drives either 1520 or 2620 FPM. This model uses a 72-inch blade with a width ranging between 1/8 to 1/2 inches in size. The work table dimensions are 14” x 12 ½” and can swivel up to 45 degrees. To do work easier even in well-lit areas, you get a flexible work light that is focused on the worktable and to maintain safety through cleanliness; you also get a 3-in-1 dust port that fits a variety of dust extractor hoses including 1-3/4”, 2-3/4”, and 4”. The worktop comes with a fence for directing straight cuts, and a miter gauge for angled cuts. The price is right, its actually extremely right, a true budget value price tag. The saw is great. 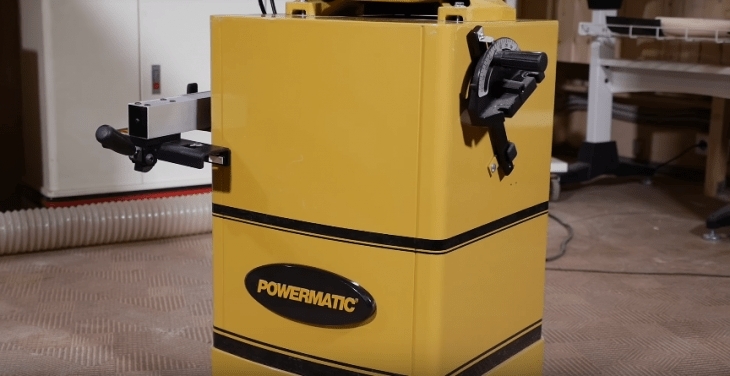 It’s a small 10” band saw that fits neatly into any garage workshop or serious woodworking site. A great tool for many functions, and personally, I use this one for my smaller framing jobs and specialty cuts. The PWBS-14CS Bandsaw is a large 14” solid workhorse with many features delivering a solid continuous cycle of high-performance cutting. The PWBS-14CS is constructed with a large two-piece cast iron table, with a 15″ x 15″ tilting section and a fixed 15″ x 5″ extension. This provides you with a total working surface area of 15″ x 20″. This model comes with a cast iron, nine-spoke wheel designed to make the blade travel smoother, and the Carter™ quick tension release lever makes changing blades safe, fast and easy. You also get a micro-adjustable dual bearing blade guide system that provides a closer blade control delivering less friction. The Poly-V belt reduces sound levels while maximizing the power transmission and it provides a comprehensive 6″ under guide capacity with 13-1/2″ frame to blade clearance. This sturdy and solid model comes with a quick-release precision aluminum T-square style rip fence with 4″ resaw attachment. For easy work conditions, you get a gooseneck lighting unit and a tensioning gauge setting that is indicated with “blade width” increments. This is a workhorse with a workhorse price. While it is an expensive tool, it is a comprehensive one that can be used for continuous cut cycles and will work perfectly well 24/7 if maintained properly. The Jet 708115K is a very basic and simple 14” bandsaw that delivers perfect performance in the hands of a professional and is also a workshop workhorse of a device. The Jet is a 14” bandsaw with a 6″ depth resaw capacity. This provides a larger surface for cutting larger pieces of wood. The 15″ x 15″ offset cast iron supports this demand, and the cast iron frame is constructed for a solid and rigged performance that eradicates vibration. 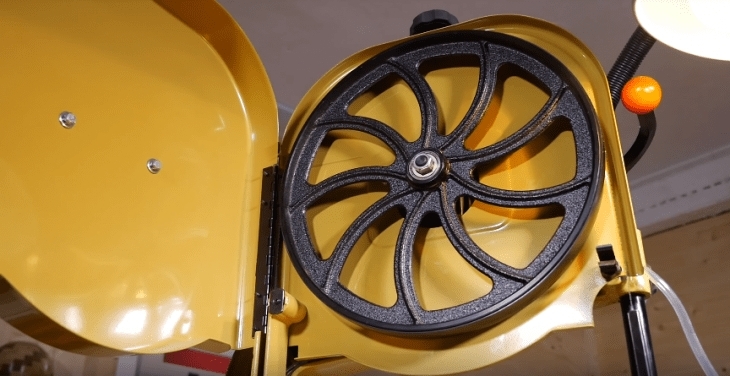 For safety through a clean environment, this unit comes with a 4″ dust port giving a direct connection to the dust collection system. The 6-spoke, precision computer balanced wheels are engineered to eliminate vibration leading to accurate blade tracking. There is a single knob tracking adjustment that makes tracking a simple and efficient process. The micro-adjustable lower blade guide is designed and integrated to assure easier adjustments and reduce set up time. The blade guide is made of a graphite impregnated polymer blade combined with roller bearing thrust guides that deliver frictionless cooler running blade with the easier setup a performance. 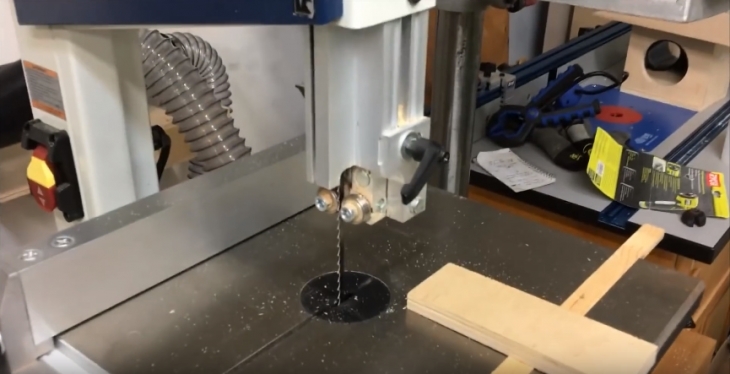 This is a higher valued workhorse of a bandsaw. Its price places it as a 24/7 capex which means it’s for a professional service or a serious woodworking enthusiast that needs a lot of constant and high-quality heavy work. 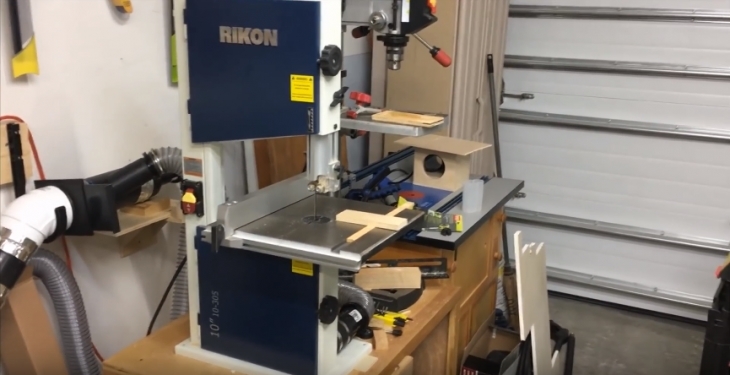 The Rikon Craftsman is a 10” Bandsaw that is designed for light work and aims at the DIY and amateur craftsman market. The design is compact and modern. 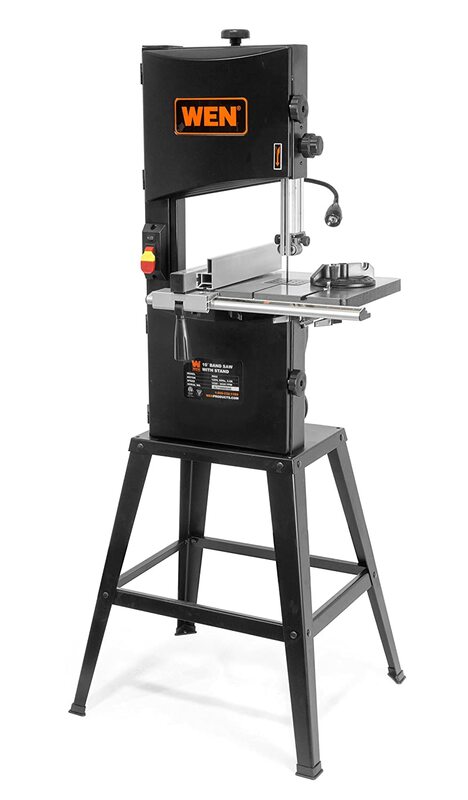 This 10” Bandsaw #10-305 comes with a 13-3/4” x 12-1/2” cast iron right tilting 0-45° table and is made of lightweight but the rigid frame for easy setup and compacted areas. The unit only weighs 68 Lbs, so you can easily set this up and move it from a storage area to a working area in a confined environment. The Rikon comes with a rip fence and a large blade tension knob. There is a convenient dust port for vacuum hookup, and for safety, the on and off switch is paddle-shaped. If its lightweight work and easy to use systems you want without all the hassle of a professional workshop, then this is the device to get. Price wise its very reasonable, performance is good, and for a lightweight cutting, this is all you really need. 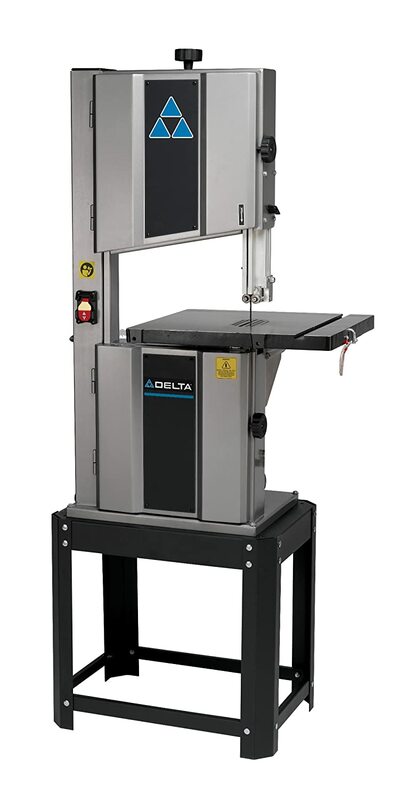 The Delta 28-400 is a 14” bandsaw table for a professional workshop or an avid woodworking enthusiast with space to work in. This model comes with a 1HP motor and has two working speeds that are 1,620 FPM and 3,340 FPM. The blades used in this workhorse are a 93 ½” minimum width to a maximum ¾” width. The device has a steel frame and the whole unit that weighs 165 lbs., making this a very solid and rigid table for setting up in one place. This bandsaw unit is used for metalwork as well as woodwork and has a 6” thick cutting capacity for plates up to 13 4/8” wide. The table itself is a solid cast iron 15 ¾” x 18 7/8” construction that comes with standardly sized t-slots that accept all 3/4 in. x 3/8 in. miter gauges. There are rubber-coated aluminum upper and lower 9 spoke wheels that have been precision balanced for optimized blade tracking which is supplemented with the precision ball bearings in both upper and lower blade guides. For a safe and clean environment, this model comes with a 4” integral dust port, and the added safety feature is a large insert that is designed to be visible for safer guide setting changes. 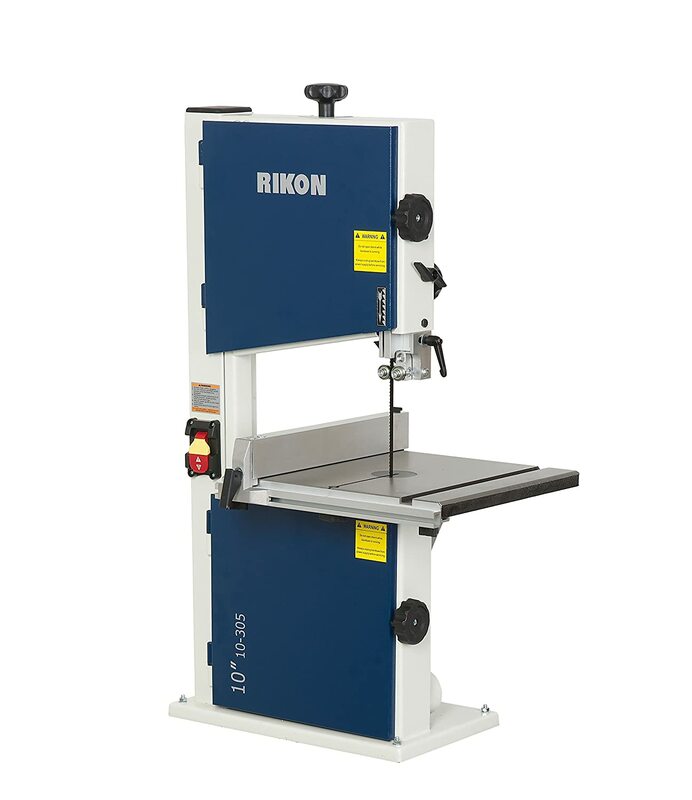 This is a midrange priced model that suits all levels of woodwork and metal working shops. It’s a great investment, but you do need to consider placement since it is a solid, heavy and rigid unit designed for 24/7 capacity. When purchasing a band saw you have to understand the fundamentals of how they operate and then consider your needs. Essentially, there are two types of the bandsaw, the three-wheel, and the two-wheel type. You might think that three wheels are better than two, but surprisingly this is not the case. While the three wheel saw does give you a larger distance between cuts, enabling you to saw larger bits of wood, the disadvantages are too many, and this detracts from this one performance benefit. Three wheel saws have smaller wheels and more turns; this increases friction, increases the number of turns a blade goes through and leads to faster blade fatigue and breakage. As such, a three-wheel saw always breaks its blade faster than a two wheel one. To put this in numbers, a 2-wheel band saw blade would last 33% longer than a 3 wheel blade. This is of extreme importance when managing a high capacity workshop. First Tip: Buy a 2 wheel bandsaw. The choice of motor is a key factor, anything below 1HP will suffer the friction and resistance to hard work. Don’t think that the pulley ratios make a difference, all they do is increase the power at the cost of the cutting speed. Second Tip: Only buy a 1HP or above motor. The cutting height is the distance from the saw table upwards to the top guide. Consider that 6” (150mm) is about the minimum a woodturner requires, as such you want a minimum of 6” in height. Take into account that a motor under 1HP will struggle with this width. Third Tip: Only buy a cutting height that is from 6” and above. For some unknown reason band saw blades are still classed in imperial measurements. The teeth are classified in teeth per inch (TPI) or points per inch (PPI). A basic tenet is that 3TPI is excellent for woodturning. A 3TPI blade will easily cut through green wood as well as handle all excessive sawdust. 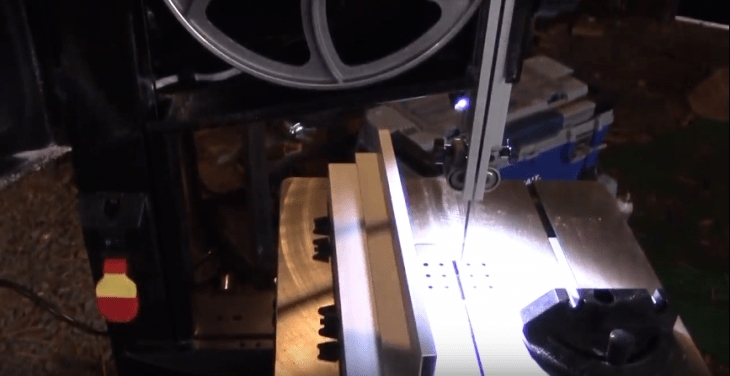 Blades are a science all unto themselves, and each wood type requires a different blade, so plywood requires more teeth as does aluminum, while softer wood and rough, hardwood can be cut with rougher teeth. The first cut might not be the last since there are initial cuts and finishing cuts. Final Tip: Always have a 3TPIO blade in stock, but make sure you have a blade for every application.